If you’re like most laboratories that are responsible for processing samples for organic compounds, you are on a constant quest to improve efficiency and operating costs while maintaining regulatory compliance and technician safety. 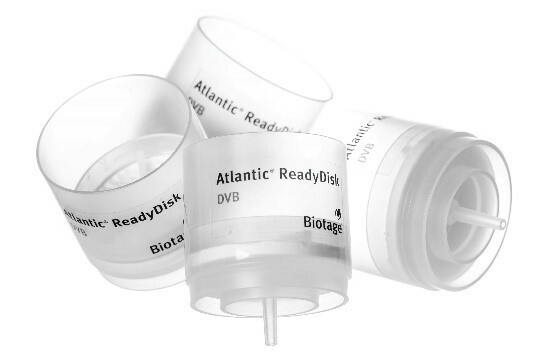 The Atlantic® ReadyDisks deliver the quality and ease-of-use you need to improve your laboratory efficiency without sacrificing data performance. These single-use SPE disk holders are designed for use in extracting semi-volatile organic compounds (SVOCs) from aqueous samples. Constructed from high quality components and pre-assembled under carefully controlled conditions, ReadyDisks deliver the accuracy and reproducibility you need, in a format that’s ready for use straight out of the box. Ready to perform your solid phase extractions with ease and convenience? Sign up now and receive your complimentary C18 or DVB starter pack. Good call - we are excited to have you try ReadyDisk! We will be in touch shortly to find out where to ship your trial disks!